Your National Title Company & Escrow Partner! Through our partner program, say yes to any order in any state! 24/7 access to our professionals and your documents. We’re there when you need us! · Secure, Compliant, & Fast! MidPoint, a National Title Company, is proud to offer title partners nationwide title and escrow solutions. No license? No Problem! Our mission is to empower our clients while providing the highest quality customer service. Empowering our title partners to say yes to any order! MidPoint, a National Title Company, can help you achieve growth by strengthening your existing relationships and providing the national backing to reach new clients with our silent partnership. Our process allows title partners to compete on a national platform by expanding their service offerings. We offer Title Only, Sub Escrow, and Full Escrow to our title partners. As a lender, enjoy fast and flexible title and escrow service from an industry leader! Utilizing advanced technology by our highly trained and friendly staff allows you to take your business to new heights. As a title partner, your organization remains the sole point of contact to your clients while our team works hard to provide you title and escrow in the most efficient manner. We view each client and transaction individually while adapting, implementing work-flows, and creating procedures to meet state and client requirements. Access your files 24 hours a day through our online web portal. Use our system to confirm processing steps, view and process notes, produce the HUD, schedule the closing, etc. Upload documents directly to the file and view all documentation during and after the transaction. Our experienced and centralized processing team can support any transaction requirement in all 50 states. With our service offerings including “Title Only,” “Sub-Escrow,” and “Full- Escrow,” we work directly with you and support all title processes from Title, Curative, HUD Development, Closing, Settlement, Funding, Recording, and Policy. Our people set us apart! With knowledgeable and dedicated individuals backing our technology and know-how, we go the extra mile to achieve excellence in customer service. Helping our clients serve their clients is what we’re all about! Why you need Title Insurance. Title insurance is protection against loss arising from problems connected to the title of real property. Prior to purchasing your home, it may have gone through several ownership changes, and the land on which it stands went through many more. There may be breakdown at some point in that chain that could emerge and cause trouble. For example, unpaid real estate taxes or liens, or someone along the chain forged a signature in transferring title. Title insurance covers the insured party for any claims and legal fees that arise regarding such scenarios. When you make an offer on a home, you will write an earnest money check that will be placed in “escrow.” That means it isn’t going directly to the seller but is being held by an impartial third party until you and the seller negotiate a contract and close the deal. You can’t touch it and the seller can’t touch it. It’s in escrow. That’s important because it protects both parties. Say you put down earnest money that went directly to the seller and then couldn’t reach a final purchase and sale agreement. You don’t want the seller holding your earnest money hostage as a negotiating ploy. Likewise, the seller won’t want to sign over the deed to the home until you’ve paid for it. And you won’t want to hand over cash without the deed being signed. Escrow ensures everyone gets what they are due at essentially the same time. Midpoint will help you achieve the growth you deserve. 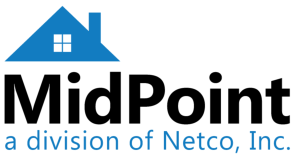 a division of Netco, Inc.